Love the song... I've actually had a difficult month myself spending nearly two weeks in the hospital with my newborn. This song was on constant repeat in my mind! Much better, thanks for asking, Jamie Jo! Going to work in a few. Thanks for the reminder of one of our primary jobs! Letting our lights shine in the darkness. 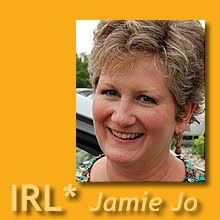 Ah, Jamie Jo, I'm sorry for your unusually emotional week. Bless you for your faith and trust and hope in the midst of it all. May God comfort you and give you His amazing peace. I send hugs and prayers. That is certainly alot of friends & acquaintances to lose in one week. It's interesting how these losses seem to come in waves. May you know His unique peace & comfort. I just realized that I never responded to your kind remarks this past week. Thank you! I should have made it more clear that none of these people were that close to me personally. Mostly they were folks on my prayer list. I'm doing fine. See you tomorrow!